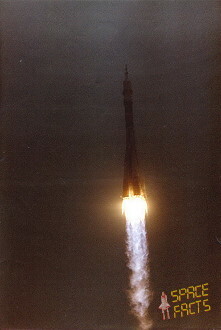 Launch from the Baikonur Cosmodrome; landing 55 km northeast of Arkalyk. The Mir core module or base block was launched on February 20, 1986 on a Proton-K rocket from at the Baikonur Cosmodrome. It had a mass of about 21 tons, a length of about 13.1 meters, and a maximum diameter of 4.2 meters. 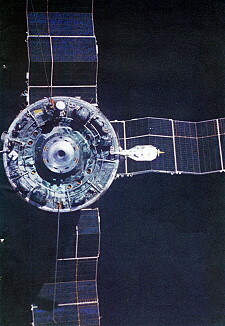 The Mir core module was the backbone of the Mir space station. 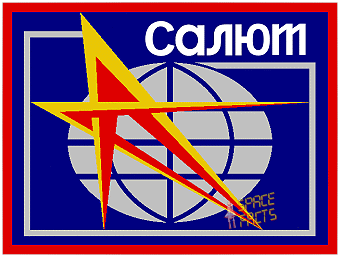 Derived from the prior Salyut 6 and 7 space stations, it acted as the principal space station control element and contained the main computers, communications equipment, kitchen and hygiene facilities, and primary living quarters. The module provided 90 cubic meters of habitable volume. The core module included six docking ports used as permanent attachment points for the other station modules and for temporary docking of manned and unmanned resupply ships. Although the core module's main propulsion system had not been operational since the arrival of Kvant1, the core acted as the principal propellant storage unit and assisted in controlling the attitude of the entire space station. The core was divided into four compartments, designated as the working, transfer, intermediate and assembly compartments. All but the assembly compartment were pressurized. A small airlock was also available for experiments or for the release of small satellites or refuse. The working compartment was the main habitable volume on Mir and consisted of two concentric cylinders connected by a tapered conical section. The interior of the working compartment was divided into an operations zone and a living area. The operations zone occupied the smaller diameter section and was the control area for the entire Mir complex. Monitoring and commanding of the core systems, scientific equipment and mechanisms were carried out in this area. The living area of the working compartment provided the necessities for long-term manned missions and contained a galley area, individual crew cabins, hygiene facilities and trash storage. Medical monitoring equipment and a bicycle ergometer were located in the conical portion of the working compartment. The spherical transfer compartment was located at the fore end of the working compartment. It provided radial docking ports, spaced at 90 degree increments, for 4 of the station's added modules with a 5th additional axial docking port for visiting transport craft. Access to the additional station modules was provided through the transfer compartment. The intermediate compartment was a 2 meter diameter pressurized tunnel that connected the working module to the aft docking port. The tunnel was located in the center of the non-pressurized assembly compartment. The aft docking port was used for visiting transport vehicles until permanently occupied by the Kvant1 module. Main engine and fuel tanks were located in the non-pressurized assembly compartment. This annular space contained the main engine and fuel tanks. Externally, this assembly supported the station's satellite relay antenna, docking radar antennas, lights and optical sensors. Power to the core module was initially provided by 2 38 sq. meter arrays providing 9 kW. A 3rd array was added to the core in 1987 to bring total power to 10.1 kW. Additional power from visiting Progress M and Soyuz TM vehicles and other station modules could be added to the station's total supply. The core contained 12 NiCd batteries for power storage. The core was also equipped with 32 137 N attitude control thrusters and 2 2.9 kN thrusters for orbit maintenance (useless while Kvant1 was attached). The propulsion system was a pressure fed UDMH/NTO system. Life support system maintained the station's environment at 18-28 deg. C and 20-70 percent humidity. An electrolytic system was used to recycle station atmosphere with a backup chemical scrubbing system. Station pointing could be controlled to within 15 arcmin. 2 primary CPUs provided most station control functions. Star sensors, IR Earth horizon sensors, sun sensors, magnetometers, gyros, accelerometers were used for attitude determination. Communication with the ground was via 11-14 GHz links through geosynchronous relay satellites. 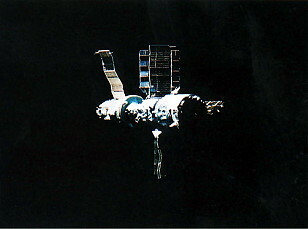 Following a two day solo flight Soyuz T-15 docked with the new space station Mir on March 15, 1986. Plans for Mir intended that only the newer Soyuz TM would dock with Mir's forward port, leaving the aft port free for arriving Progress spacecraft. However, the older Soyuz T actually used for the first Soyuz T-15 mission to Mir was not equipped with the Kurs approach system used on Mir's front port, but only with the older Igla approach system used for Mir's aft port. Therefore Soyuz T-15 had to approach Mir's aft port, and then manually maneuver around the station to dock manually at the forward port. At 20 km Soyuz T-15's Igla system acquired its counterpart on Mir's aft port. At 200 meters, the Igla system was shut off, and the crew manually maneuvered around the station to dock at the front port. For this manual approach, the same laser range finder was used as for the Soyuz T-13 docking with the uncooperative Salyut 7 station in 1985. 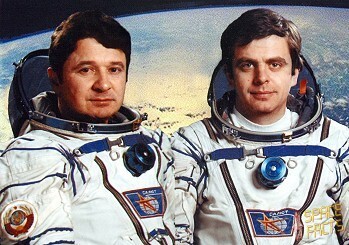 The cosmonauts became the first resident crew of Mir. In preparation for the trip to Salyut 7, the crew loaded Soyuz T-15 with their personal belongings, plants grown on Mir, and other items. At that time Salyut 7 was still 4000 km ahead of Mir in a lower orbit. Therefore on May 04, 1986 Mir was lowered by 13 km in order to speed the approach to Salyut 7 and conserve Soyuz T-15's limited fuel supply for the transfer. On May 05, 1986, they undocked from Mir for a day long journey to the Salyut 7 space station and stayed there for 50 days. The cosmonauts manually docked with the inoperative Salyut 7 station. This was the only flight in history by a single spacecraft between two space stations. The Salyut 7 station was found to be ice bound and without electrical power. The crew repaired the station, regaining power, heat, and environmental control. The also removed experimental results left behind by last crew. 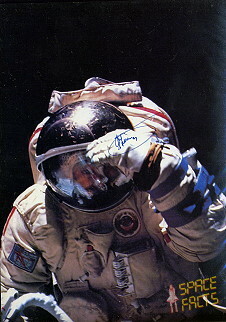 Leonid Kizim and Vladimir Soloviyov conducted the first EVA while staying on Salyut 7 on May 28, 1986 (3h 40m). 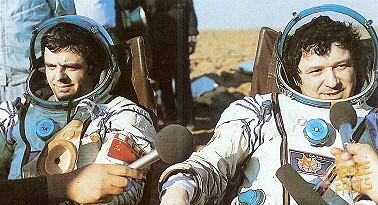 Vladimir Soloviyov and Leonid Kizim first visited the new Mir station then transferred to Salyut 7 to tie up loose ends left by the station's previous crew, which had been forced to end its mission early after Vladimir Vasyutin, became ill. Vladimir Vasyutin and Aleksandr Volkov were to have performed EVA assembly experiments outside Salyut 7 while Viktor Savinykh assisted from inside Salyut 7. 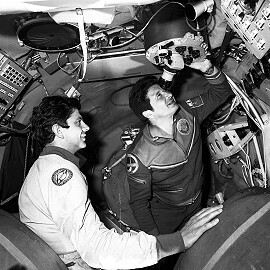 Vladimir Soloviyov and Leonid Kizim removed and placed inside the transfer compartment space exposure cassettes and the joint Soviet-French micrometeoroid collector deployed in August 1985. The exposure cassettes included Spiral, for study of space effects on cables, Istok, which looked for changes in threaded connectors (nuts and bolts) caused by space exposure, Resurs, which studied space effects on metals, Meduza, which studied space effects on biopolymers. The cosmonauts then attached the cylindrical 150-kg (330-lb) URS space assembly device to the hull outside the airlock hatch. The URS device deployed a 20-kg (44-lb), 12-to-15-m (40-to-50-ft) tubular metal truss held together by hinges and springs. URS was designed and built by the Paton Institute of Electric Welding in Kiev, which also developed the URI tool used by Svetlana Savitskaya during her 1984 EVA. The URS truss was deployable, as opposed to the erectable EASE and ACCESS systems Jerry Ross and Sherwood Spring worked with 7 months earlier on STS-61B. Pravda, quoting Paton Institute sources, stated that the truss' length could be increased to a kilometer or more by adding more folded cassettes. 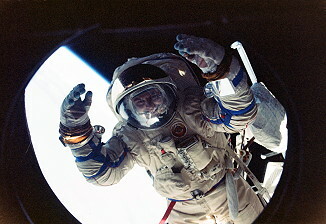 Leonid Kizim operated the three buttons that controlled deployment, then climbed halfway up the truss. He found it sturdy, with oscillations limited to a few centimeters of amplitude. The top of the URS truss carried Leningrad Polytechnical Institute's 3-kg (6.6-lb) Fon ("Background") device, which assessed the environment around Salyut 7. The cosmonauts installed the BOSS visible light communications system on a work compartment porthole, then refolded the URS girder and closed out the EVA. 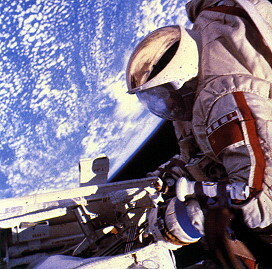 Portions of the EVA were televised live to Soviet audiences. They spent the next two days cleaning their Orlan-DM suits, undergoing debriefing, and preparing documentation. 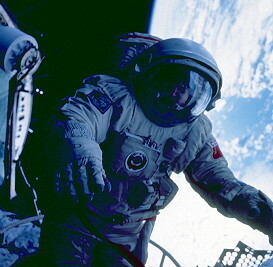 Both cosmonauts performed a second spacewalk on May 31, 1986 (5h 01m). The cosmonauts extended the URS truss, then used the BOSS device installed on the previous EVA to relay data on truss stability from instruments at the top of the truss. 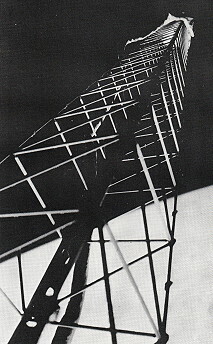 These included a small seismograph built by the All-Union Scientific Research Institute of Geophysics for tracking low-frequency (small) vibrations imparted by the station's acceleration, and the Mayak ("beacon") experiment, in which a camera tracked high-frequency vibrations by filming the movements of a small orange light attached to the truss. Vladimir Soloviyov and Leonid Kizim then rigidized the truss by welding portions using the URI tool. After closing and dismantling the truss, they installed the Mikrodeformator device built by Kharkov Polytechnical Institute, which studied aluminum-magnesium alloy reactions to repeated ("complex cyclical") structural loads under space conditions. At the end of the EVA, they brought inside the sample of solar cell material left outside by Viktor Savinykh and Vladimir Dzhanibekov in August 1985. According to Pravda, ". . .successful accomplishment of multifaceted experimental operations in open space confirms the prospects of the technological operations that have been developed, as well as the possibility of their practical application in creating complex, large-size orbiting complexes for scientific and economic purposes." The crew removed 20 instruments with a total mass of 350 to 400 kg including a multichannel spectrometer from Salyut 7 before returning to Mir. Between August 19, 1986 and August 22, 1986, engines on Kosmos 1686 boosted Salyut 7 to a record-high mean orbital altitude of 475 km to forestall re-entry. Atmospheric drag took its toll, however, and the station re-entered over South America 54 months later. Pieces of Salyut 7 and Cosmos 1686 were found in Argentina. After done work the cosmonauts returned to the Mir space station on June 26, 1986 in a 29-hour journey. It was the first transfer from one space station to an other space station in space history. Last update on April 22, 2018.